It’s nowhere near over yet!! The festivities have maintained their frenetic pace at Kisc over the past few days. Each group has been taking part in a variety of activities and campsite challenges as part of working towards the Kisc badges and having a really fun time. 1st Camborne Scouts completed the hike to the Ueshinenhut as part of the overnight expedition to the high alpine hut. This included the scouts cooking for themselves (which apparently didn’t taste that bad) as well as getting to experience sleeping high in the mountains and experiencing the fantastic sunrise. That was followed on Monday afternoon by the high ropes course in Kandersteg with the three different levels providing challenges and excitement for all the Scouts and Explorers. The Aare Float trip takes the group from Thun to Bern in a 10-person raft allowing them to experience the natural wildlife as well as enjoying a refreshing float in the flow of the river and chilling on the upside down raft in the sunshine. This was followed by a visit to the Bear Park in Bern to see the Grizzlies before taking a shopping trip to buy souvenirs. 10th York Guides have had a super busy four days including their excursion to Bern to take in the abnormal sight of bears in the centre of the city and of course do some shopping! A relaxed day on Tuesday preceded the Bern trip. Multi-crafts started bright and early with the Guides making pin-bead badges and leather woggles. The group took a trip to Our Chalet, the International Guiding centre and to Adelboden to take a look at another traditional Swiss village. Congratulations to the Scouts from 1st London Colney who were winners of the International Sports Afternoon on Sunday. The Scouts get split up into teams with people from other groups from all over the world allowing them to meet people from a variety of different cultures and many nationalities. 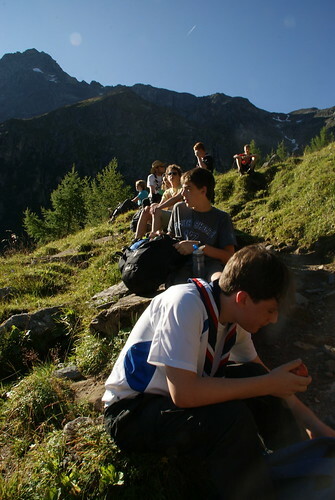 The patrol challenge on Mondays requires Scouts to take on different tasks and find out lots of information from around the campsite and Kandersteg village. On Tuesday the group went up to Oeschinensee to have a go at the tobogganing and swimming in the freezing mountain lake. The evening activities this week have included the barbecue and international evening which featured food, games and displays from right around the globe. Sunday was the pioneering competition where teams were challenged to build a catapult to fire at a human target as well as a free standing bridge to withhold the weight of the team! Race the World takes place every Tuesday night, with this weeks event seeing the scouts take part in relay races from all over the world including the elephant race from Africa, the horse race from Canada, the water race from Switzerland and the dizzy race from the land down under!! The last couple of days are absolutely packed with activities and I’m sure this week being the last week will be just as great if not better than the rest!